The new Porsche 911 GT Coupe is a special edition version of the iconic 911. It’s an explosive and dramatic track-focused model that’s aimed at enthusiasts who want the purest 911 experience possible. There are actually two variants available – a GTS model and a GT3 RS model – both of which we’ll be covering in this review. The former develops 444bhp, while the latter produces a positively filthy 513bhp. Neither are cheap to run but let’s face it, you’re only here for one thing – to have fun. Porsche started a long career in carmaking in 1931 with the design of the Volkswagen Beetle. Read more about how they progressed from there to the design of luxury sports cars in our brief history of Porsche. OSV takes a closer look at what they’re all about with our 2018 Porsche 911 GT Coupe review. The 911 has been around for a very long time, and over the years Porsche have spent time refining it so that it gets better and better with each passing decade. Previously, the huge rear-mounted engine was poorly positioned, which meant that the car was a bit too unpredictable. Now, they’ve got it just right and the handling is perfectly balanced. All models are rewarding and exciting to drive, but it’s the GT models that really do take things to the next level. They come with a gorgeously crafted aerodynamic body kit that pumps out so much downforce that the car is always safely wedded to the tarmac as you race down the track. For the GT models, Porsche have also tweaked the suspension and steering so that they’re the most dramatic 911’s yet – and when you consider the glorious history of the car, that really is saying something. The steering offers plenty of feel, and your confidence is further enhanced by the sheer amount of grip on offer. Moreover, while the standard 911’s now come with turbochargers, the GT3 RS model remains naturally aspirated. That might have a damaging effect on running costs, but it means its drivability is true. First up is the Carrera GTS model. Its turbocharged petrol engine – which is seen in other 911’s across the range – develops 444bhp, has a 0-62 time of 3.8 seconds if you stick to two-wheel-drive and comes with a seven-speed PDK dual clutch automatic transmission as standard. Four-wheel-drive is available, and if you specify it the car can motor its way from rest to 62mph in 3.6 seconds. It sits 20mm lower than the rest of the 911 range, and this improves balance, handling dexterity – and it also allows the car to go faster. Next up is the GT3 RS model. It’s powered by a naturally aspirated 4.0-litre flat-6 engine, develops 513bhp, and rockets you from a standstill to 62mph in an astonishing 3.2 seconds. It’s more engaging and agile than last time, but to truly get the best out of it you’d need to take it out onto the track. That said, the car impresses us at more moderate speeds too, and it’s a lot of fun on winding country roads. How reliable are Porsches? Read our unbiased assessment of their cars to find out more. The GT models are similar to the standard 911 inside, although there are one or two noticeable differences. The biggest difference is the roll cage, which here is positioned behind the two front seats. Meanwhile, Porsche have thrown a few top quality Alcantara and leather materials into the mix, as well as standard lightweight bucket seats. Ride quality, meanwhile, is okay but you expect any car that can whizz you from rest to 62mph in 3.2 seconds to feel a bit crashy at times. The GT is fine on smoother surfaces but less comfortable on poorer surfaces. Other than that, the cabin is a lot like the standard model. This means you get a 5-dial layout, a slick and modern design, top-notch materials and a low driving position. The controls are ideally positioned and build quality is excellent. Is the Porsche 911 GT Coupe practical? The standard 911 has rear seats, but the GT models dispense with them altogether. They were only big enough for small children anyway. However, Porsche have replaced them with a roll cage which makes it hard for you to use that space behind the front seats as an extra storage solution. A 145-litre boot sits beneath the bonnet, while storage spaces include a pair of cup holders and a lockable glovebox. Standard kit for the GTS model includes 20” black alloys, a special Sport Design bumper, a black front splitter, satin-black tailpipes, smoked lenses for the rear lights, a stopwatch on the dash, aluminium trim, and an enhanced version of the brand’s Track Precision app. The GT3 RS model adds its own unique, naturally aspirated engine, four-wheel-drive, a Bose surround-sound stereo system, fully electric sports seats, enhanced interior materials, a sports steering wheel and a sporty body kit. In terms of how safe the cars are, the GT models haven’t and won’t be crash tested by Euro NCAP (and neither will the standard 911). Safety tech includes head airbag’s, thorax, and side-impact protection. The high-performance brakes and the sheer amount of traction should help to give you a bit more peace of mind. Prices for the new car start at £101,000 and rise to £141,350 for the GT3 RS. For more information on our leasing deals, you can check out our page here. In terms of its running costs, neither of the two GT models are cheap to run – as expected. The GT3 RS model returns 22.1mpg at best and emits as much as 291g/km of CO2. The GTS model, meanwhile, fares better. Fuel economy is officially pegged at 30.1mpg, while emissions stand at 212g/km of CO2 if you stick to the manual gearbox. Opt for the PDK automatic and you can return 34mpg on a (very) good day, while emissions top 188g/km. All GT models have a BiK rating of 37% – the highest there is. Porsche’s rivals were praying to the gods that the German brand wouldn’t deliver a GT that was faster, sharper and even more fearsome than last time – but those prayers weren’t answered. The smaller GTS model can return 34mpg at best, which is very attractive. The GT is one of the most feel-some cars on the planet. The GT doesn’t make too much sense if it’s your only car. 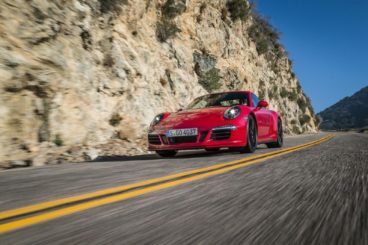 Let’s see how the car fares against its rivals in the comparison section of our 2018 Porsche 911 GT Coupe Review. The new Mercedes AMG GT Coupe was designed specifically to rival the 911. It represents a solid alternative and it’s great just to look at. On the road, standard Mercedes models are known for their high comfort levels more than their high-performance levels, but these AMG models take things up a few notches. The AMG GT Coupe sits low to the ground, distributes its weight perfectly between front and rear, and handles like a dream. In fact, it’s the sharpest and most responsive AMG model yet. The steering is nice and light in the towns and cities, and while it’s twitchier at high speeds than the 911 GT, it’s still a great car to drive. In terms of its engines, a 4.0-litre petrol unit powers the car. 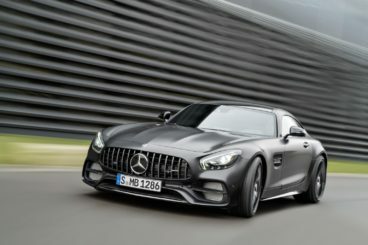 The standard AMG GT model launches you from rest to 62mph in 4.0 seconds flat, while an AMG GT S model completes the same sprint in 3.8 seconds. A GT-C model, meanwhile, develops a staggering 550bhp, which is enough to motor its way from a standstill to 62mph in 3.6 seconds. There’s still more to come. Rounding off the range is a GT R model that catapults you from 0-62 in 3.5 seconds before maxing out at 198mph. It produces 580bhp. Running costs? The standard model is the cheapest to run, and it can return 30.1mpg on a good day while emitting 219g/km of CO2. The GT-C model, on the other hand, manages 24.8mpg and emits as much as 259g/km. Inside, the AMG GT sets the standards in this class. The cabin is exquisitely designed and put together, the quality justifies the price, and while it’s not the most ergonomically sound interior you’ll ever see, it catches the eye more than the Porsche. However, while its standard kit is good and includes sat-nav, the brand’s COMAND system and cruise control, the list of optional extras is long – and expensive. Is the Mercedes AMG GT Coupe practical? It doesn’t offer a lot of space, and its thick windscreen pillars won’t help as you pull out of junctions. Moreover, a rear parking camera and parking sensors aren’t standard. Storage solutions are poor and include a tiny glovebox, but the 350-litre boot is a massive bonus. That said, once the load cover is in use you can only use 285-litres of its total capacity. 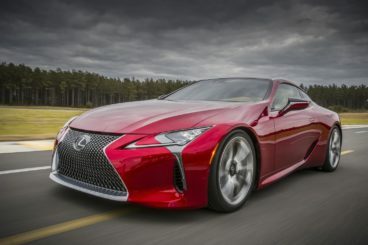 The new Lexus LC is an eye-catching powerhouse that’s backed by a V8 engine. There are actually two models on offer – a V8 and a hybrid V6. The former offers more power and can get you from rest to 62mph in 4.5 seconds, while the latter covers the same sprint in 4.8 seconds. It’s not far behind on the speed front, then, but its CVT automatic gearbox somewhat ruins its appeal. Moreover, the V8 is more spirited to drive, although neither model can rival the 911 when it comes to a pure driving experience. For one thing, both models lack feel. Running costs? The V6 hybrid model can return as much as 44.1mpg, which makes it the most frugal engine in this review. It also emits just 149g/km of CO2, which gives it a BiK rating of 28%. The V8 engines numbers, on the other hand, are much closer to the Porsche’s. It returns 24.4mpg at best and has a BiK rating of 37% – the highest there is. Inside, the LC is nothing less than we expect a Lexus cabin to be. It’s plush, well-designed and a very pleasant place to spend your time on the road. A TFT digital instrument display sits in front of the driver, the quality of the materials is high, while nice touches include cast-aluminium door handles and heated and cooled seats. Ride quality, meanwhile, is good for the most part, with only the poorest of surfaces causing a bit of discomfort. Is the Lexus LC practical? It comes with a pair of rear seats, but they’re only big enough for two very small children or a bit of extra luggage. Like the Porsche, it’s a three-door, and while Lexus market it as a 2+2 Coupe, it isn’t really. The boot measures 197-litres if you go for the V8 version and 172-litres if you opt for the hybrid. Porsche have always been very good at producing stunning, track-focused cars, and they’re not going to slow down now – and neither are their cars. Aggressive, fast, gorgeous to look and sit in, the new Porsche 911 GT Coupe is everything you dreamed it would be and more.